Regatta's Ad Quest is a very flexible, mid weight fabric walking boot. Although not Vibram manufactured, the rubber sole has a decent 4mm lug pattern and is built around a half steel shank. However, the sole is made from what appears to be relatively soft rubber, which may not wear that well on rougher terrain or very frequent use on tarmac. There's quite a lot of stitching on the upper, which does not have the benefit of a rubber bumper/rand around it. Neither is there much protection in the front/toe area which is really quite soft. However, there is some decent padding around the ankle top and on the tongue which so far has not compressed. The lacing system is pretty simple in that there's no intermediate locking system at all. The fit appears to be true to size lengthwise however I think they are a relatively broad ft, which suited me fine. My main problem came in trying to tighten the boot properly, which - by virtue of the simple lacing system and the padding on the tongue - was really quite difficult. Consequently, despite my best efforts, I did experience some heel lift which detracted somewhat from what were otherwise comfortable (albeit rather warm) boots on the few day-long, low level walks I've used them on so far. They've been water proof in light rain and when walking through grass. In an office based simulation of heavy rain, they also performed well - it was possible to see the water repellancy layer in action as the water beaded off the uppers. I'll report back on how well this performs over time. I did note that there is a two year manufacturer's guarantee that appears to cover both the ISOTEX technology and the outer sole. This boot is available from Outdoor Look. 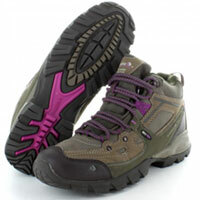 You'll need to invest more in boots suitable for regular walking on rough terrain and/or mountain walking. However, Regatta's Ad Quest are a decent, budget option that will suit the occasional valley/canal towpath/woodland walker.